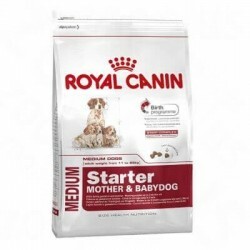 Royal Canin Medium 15 kg is a high-quality dry food, totalemnte balanced, provides vitality, and all the necessary nutrients for your dog. The feed for dogs Royal Canin Medium Adult is an unbeatable option, complete and balanced, especially indicated for the daily feeding of adult animals of breeds, medium-sized (between 11 kg and 25 kg). It is convenient to feed it from the end of the growth, in breeds medium sized is established in the 12 months up until 7 years old, considered middle age. 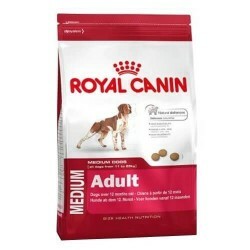 Royal Canin Medium Adult contains the nutrients necessary for adult dogs of breeds medium to be healthy and vital. Its high content of high-quality protein keeps your muscles strong. Contains an energy value high (3857 kcal/kg) to cover all the needs of animal activity. It also contributes to the care of the skin and brightness of your hair, thanks to the omega fatty acids 3 and 6. For a good functioning of the transit in digestive tract, its ingredients provide the fiber that you need to significantly improve the quality of their bowel movements. And the EPA-DHA prevents intestines to become inflamed producing discomfort in more sensitive dogs. A feed is enriched with antioxidants and mannan-oligosaccharides strengthen its natural defences, allowing the optimal functioning of your immune system. This feed contains ingredients that satisfy considerably the appetite of the dog, saciándolo and avoiding hunger at bay.In addition, their ingredients are meticulously selected to provide you with a flavor that is irresistible. Dog food designed especially for adults of average size. Contains fibers that improve digestion. It offers a large amount of energy that keeps your active pet. Promotes the appearance of your dog, improving the health of their skin and their fur. dehydrated poultry proteins, corn, corn flour, wheat flour, animal fats, wheat, hydrolysed animal proteins, beet pulp, fish oil, soya oil, yeasts, minerals, hydrolysed yeast (source of mannan-oligosaccharides). metabolisable energy (calculated according to NRC2006) (3857,44 kcal/kg). magnesium (0,08%),sodium (0.4 per cent), iron (143 mg/kg), manganese (76 mg/kg), zinc (224 mg/kg), iodine (5.3 mg/kg), selenium (0,32 mg/kg), potassium (0.7 per cent), copper (15 mg/kg), chlorine (0,62%). folic acid (0.6 mg/kg), choline (2,000 mg/kg), vitamin B1 thiamin (3.1 mg/kg), vitamin B2 riboflavin (2.9 mg/kg), vitamin B5 adic pantothenic acid (19 mg/kg) vitamin B3 niacin (11,3 mg/kg) vitamin B6 pyridoxine (6,2 mg/kg), vitamin D3 (800 IU/kg), vitamin B12 cianoconobalamina (0.05 mg/kg).